(Bloomberg) -- Finland’s Center Party said it will likely seek to be in the opposition over the next four years after suffering a massive loss in Sunday’s general election, making the coalition talks more difficult for election winner Antti Rinne of the Social Democrats. “The bar is high for the Center Party to join government after this election loss,” the group said in a statement after voters punished the party for the center-right government’s tough labor-market policies and failed healthcare reform. The decision to bow out of the talks gives more leverage to National Coalition leader Petteri Orpo, whose group came in third after the nationalist Finns Party. The Finns are seen as a long shot to become part of any coalition since its strident anti-immigrant rhetoric clashes with the values of the establishment parties. Rinne needs at least one of the three big parties in his coalition to reach a majority in parliament. Center Party leader Juha Sipila also said he intends to step down on Sept. 7 after the party has chosen a new leader. That could potentially mark an end to his political life after he abandoned a business career to lead the party to victory in 2015. He will continue to serve as caretaker prime minister until a new government is formed. 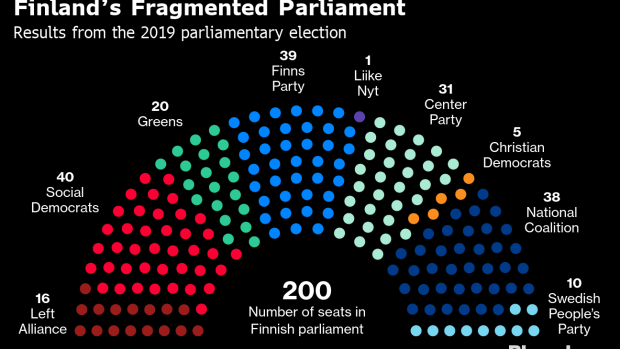 Finland now looks set to get a more left-leaning government, with the likeliest coalition formed by the Social Democrats with the Greens, which achieved a record backing, the center-right National Coalition, and the Swedish People’s Party. While the Center Party didn’t completely rule out joining the government, it set so many red lines that reaching any compromise will be difficult. The party’s decision brings to mind its 2011 electoral defeat when it immediately announced a decision to spend the term in opposition. That made things harder for then-coalition builder Jyrki Katainen as other parties sought to extract large concessions. In the end, it took two months before a six-party government was formed. This time, Rinne has said he targets having a cabinet lined up by the end of May.